Harry Morgan is a policeman-turned-fisherman down on his luck like so many others in the Depression-struck Florida Keys. To make ends meet, Harry begins engaging in increasingly dangerous illegal activities in the waters between the Keys and Cuba. The book opens on Harry and several Cuban revolutionaries who want to pay Harry an exorbitant fee to transport them to the United States. Harry refuses, preferring to use his boat for legal activities, and as the revolutionaries leave, they are gunned down in the street. However, after being tricked by a customer who charters the boat for three weeks and then vanishes without settling his account, Harry agrees to smuggle Chinese immigrants from Cuba to the mainland. Next, Harry begins running alcohol between the two countries, and a confrontation with Cuban customs lost Harry his arm and his boat. Undeterred, he signs to the next scheme he runs across: stealing a boat and ferrying Cubans involved in a bank robbery back to their homeland. As he descends ever-deeper into desperation, Harry meets old friends and new faces. He has little patience for those who have not remained as resilient to the times as himself, and he has no patience for outsiders. Tensions mount between this hardscrabble jack-of-all-trades and several tourists who frequent his local bars. One pair of tourists take special prominence in the book: Arthur, an unexceptional writer, and his beautiful, unhappy wife. When Arthur comes home one day after sleeping with yet another woman, his wife decides to leave him for another man, an alcoholic who has been seen sloshing around the bars as well. Meanwhile, you are given a peek into the intimate details of Harry’s relationship with his wife, Marie. The quiet desperation with which they cling to each other is meant as a justification for Harry’s illegal maritime activity. Unfortunately, Harry does not return home after his trip with the Cuban bank-robbers, and Marie becomes yet another Depression-era woman left wringing her apron in desperation and rage. I’ll be the first to admit that I have a bit of a Hemingway obsession. One of my literary goals is to read all of his books, and I’m not too far from the finish line. However, To Have and Have Not is my least favorite Hemingway book so far. Though Hemingway attempts to dissect grand social issues, such as troubled economic times and the relationship that exists between husband and wife, the entangled sub-plots and the erratic activities of the characters serve to distract from whatever statement Hemingway is trying to make. The unexpected changes in viewpoints are disorienting, and the stories of other characters either stop abruptly or trail off seemingly without resolution. Harry remains the driving force of the novel, if there is one, even when the narrative meanders through the viewpoints of those who interact with him. Though his motivations inspire pity, his actions encourage judgment. Ultimately, I felt indifference toward him. One aspect of the novel that I did enjoy, however, was the marine setting. I liked the descriptions of Harry’s boat and the protective feelings that he felt for her. 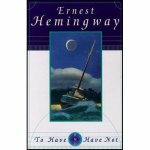 However, if you want good writing by Hemingway about the nautical life, read The Old Man and the Sea. In fact, skip this book and read Old Man anyway.